This work studies the largest of the Northern-based international relief and development NGOs. It examines how organizations are responding to the transformative changes globalization demands, and how infrastructures are being organized on a worldwide basis. - Publisher Based on a unique insiders' perspective, GOING GLOBAL is the first book-length comprehensive study of the largest of the Northern-based international relief & development NGOs. Marc Lindenberg & Coralie Bryant examine how organizations are responding to the transformative changes globalization demands, how infrastructures are being organized on a worldwide basis, & the challenges of accountability, evaluation & organizational learning. Also discussed are the growing significance of complex emergencies, peacebuilding & advocacy work, as these new contexts grow in importance compared with traditional development project work. Constructed from extensive international fieldwork & unique & candid group discussions of NGO presidents & CEOs, GOING GLOBAL will be invaluable to anyone studying nonprofit management issues in general, as well as the specific challenges faced by relief & development organizations. - Publisher * An innovative look at changing roles of NGOs in global politics* Based on extensive fieldwork and discussions with NGO presidents and CEOsThis is an invaluable resource to anyone studying general nonprofit management issues, as well as those studying the specific challenges of relief and development organizations. Boasting a unique insiders' perspective, it is the first book-length study of the largest Northern-based international relief and development NGOs.The authors address the challenges of accountability, evaluation, and organizational learning for NGOs and the growing significance of complex emergencies, peacebuilding, and advocacy work. They evaluate how infrastructures are being organized on a worldwide basis and responding to the transformative changes globalization demands. Based on a unique insiders' perspective, GOING GLOBAL is the first book-length comprehensive study of the largest of the Northern-based international relief & development NGOs. Marc Lindenberg & Coralie Bryant examine how organizations are responding to the transformative changes globalization demands, how infrastructures are being organized on a worldwide basis, & the challenges of accountability, evaluation & organizational learning. Also discussed are the growing significance of complex emergencies, peacebuilding & advocacy work, as these new contexts grow in importance compared with traditional development project work. Constructed from extensive international fieldwork & unique & candid group discussions of NGO presidents & CEOs, GOING GLOBAL will be invaluable to anyone studying nonprofit management issues in general, as well as the specific challenges faced by relief & development organizations. * An innovative look at changing roles of NGOs in global politics* Based on extensive fieldwork and discussions with NGO presidents and CEOsThis is an invaluable resource to anyone studying general nonprofit management issues, as well as those studying the specific challenges of relief and development organizations. Boasting a unique insiders' perspective, it is the first book-length study of the largest Northern-based international relief and development NGOs.The authors address the challenges of accountability, evaluation, and organizational learning for NGOs and the growing significance of complex emergencies, peacebuilding, and advocacy work. They evaluate how infrastructures are being organized on a worldwide basis and responding to the transformative changes globalization demands. Marc Lindenberg was dean of the University of Washington's Daniel J. Evans School of Public Affairs and an influential scholar and practitioner in humanitarian relief and international development. Coralie Bryant Professor and Director of the Economic and Political Development Program at the School of International and Public Affairs, Columbia University, is also assisting L'Institut des etudes politques, (Sciences-Po) in Paris with the development of their Atelier in Development. 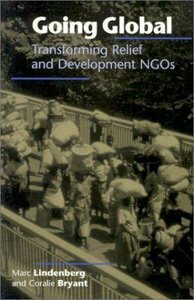 Both Coralie and Christina worked with Marc Lindenberg on a previous Kumarian book, Going Global: Transforming International Relief and Development NGOs. Prior to Columbia University, she was a senior staff member of the World Bank, where, among other work, in 1990-1991 she was one of the central authors and negotiators for the World Bank's first policy paper on governance.